WiFi INCLUDED! GOLF CART INCLUDED!! If you are looking for a great home at a great price, you have found it, Randy and Donnas Beach House Surfside Beach, SC. We are located in a Private Gated 144 acre community with 24-hour security, private beach access, including an oceanfront restaurant. The beach house is within walking distance to the ocean and both indoor and outdoor swimming pools, golf cart is included in the rental making the ocean, pool & playground only minutes away. We are located in Surfside Beach, near the edge of Garden City Beach, which is a less-crowded Family Beach, five miles south of Myrtle Beach. All major attractions of Myrtle Beach are a short 15-minute drive away. Also, Murrels Inlet, with over 30 Seafood Restaurants is only ten minutes away. Water Park and Flea Market are one mile from the Guard Gate entrance. Our home is ready for your family to enjoy. The kitchen has New Granite Countertops, New Paint, New Flooring is fully equipped and ready to accommodate your group. We have a full-size washer and dryer, which allows you to pack light and enjoy all the comforts of home. There are four bedrooms with two and a half baths, plenty of room for 2 families. A third enclosed shower is on the side deck for adults to use in warm weather, and kids anytime (cold water only). Sleeping arrangements are as follows by bedroom: BR #1 Two queen-size beds, BR#2 One queen-size bed, , BR#3 One double bed with a single bunk above, and BR#4 has one set of bunk beds. The den has leather furniture, new flooring and freshly painted. 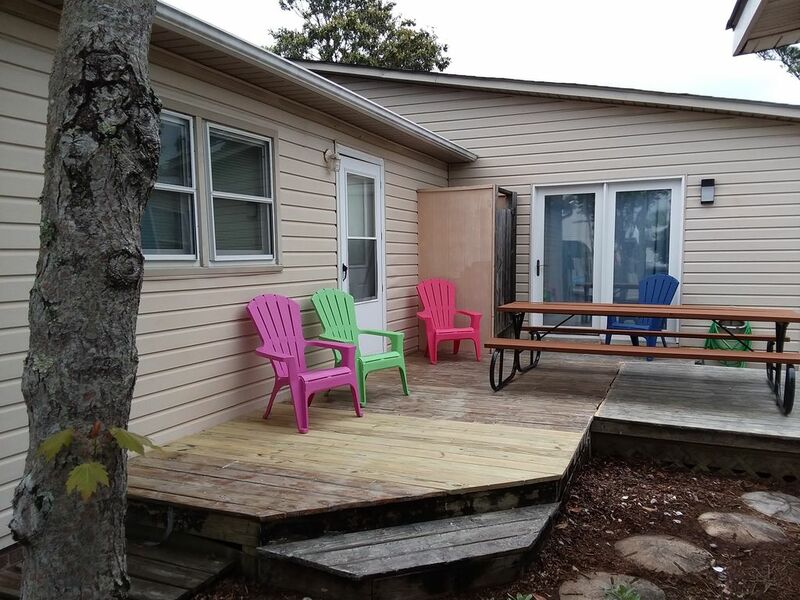 While at our home, you can enjoy relaxing on the side deck, freshly painted front sun room porch or stay inside and chill. Our home is SMOKE FREE and pets are NOT ALLOWED. Outside of the front sun porch is a shower area for rinsing off all of your beach chairs, toys, towels, etc. Our community offers Several swimming pools plus a kid's Water Play Park (one heated indoor which is open year round), three tennis courts, playground, basketball court, softball field, and numerous lakes to fish, all within easy walking distance. On site Fitness Center now open for a small weekly fee, to be paid at front office. WE DO REQUIRE A $300 REFUNDABLE DAMAGE / SECURITY DEPOSIT FOR ALL RENTALS. WE DO ASK THAT YOU LEAVE THE HOME AS YOU FOUND IT. YOU WILL NOT BE CHARGED IF THE HOME IS LEFT IN THE SAME CONDITION AS WHEN YOU CHECKED IN. BED AND BATH LINENS CAN BE ADDED FOR AN ADDITIONAL FEE. DEPARTURE CLEAN CAN BE ADDED FOR AN ADDITIONAL FEE. You may bring your own linens OR they can be provided at a cost based on the # of occupants, your choice. Parking for up to 3 vehicles, No on street parking allowed. You may bring your own Towels OR they can be provided at a cost based on the # of occupants, your choice. Dining table has 2 long bench seats on each side to accommodate a large group. 3 pools on property, 2 outdoor and 1 heated indoor PLUS a kid's water play area and outdoor hot tub. Our beach house is the perfect vacation rental in a family community offering private beach front access, oceanfront dining, close to shopping, family fun, entertainment, Tupelo Bay Golf Course just across the street & more than 25 other golf courses nearby. There is always great deals on golf to be found. Nearby Murrells Inlet is home to Fishing, Charter Boats, Watersports & many great restaurants. The Grand Strand Area of Myrtle Beach has more than 2000 Restaurants serving every cuisine under the sun. The area has an abundance of nightlife and entertainment such as Carolina Opry, Alabama Theatre, Dolly's Pirates Voyage, Ripley's Museum, Hard Rock Cafe and Broadway at the Beach. This Homeaway from home is also very close to the Myrtle Beach Airport.